Can Training Fix Bad Management? Employees leave managers, not organizations. In fact, 50% of them do. But how do you turn a bad manager into a good one? Train them on how to be better, right? Nope – training rarely sticks. Even the best-intentioned manager will often revert to old, comfortable but ineffective habits. Securing lasting adoption requires a system of engagement that reinforces application of effective management practices every day. Companies make hiring decisions based on poorly defined criteria. Then, they try to fix that with one and done training – investing significant time, effort and dollars with little to show for it. Let’s look at why these programs often fail to deliver, and how you can make them more actionable and effective. A Canadian retail giant ran their annual engagement survey. It was the fifth year in a row employees scored themselves as extremely dissatisfied with management practices. They complained about trust issues, lack of accountability, unclear focus and little direction from their managers. This naturally created an environment of stress, conflict and a disengaged workforce. Both new and experienced managers were aware of the gap. It now became a major red flag with HR and top executives. Leadership responded with a commitment to provide a path for more training for managers. Resources, both human and financial, were dedicated to fully supporting the initiative, making it a top priority. HR hired a coaching firm to provide two-day training for all managers in all their 20+ locations across the country. In follow-up employee surveys, a few months later, overall feedback found little or nothing had changed. While training was well put together and well received, it had little impact on lasting improvement. It was only a matter of time before participants defaulted to bad management habits. Managers are technical specialists. They generally rise through the ranks in recognition for their individual contribution as top producers. They find themselves managing teams without being ready for it. Dealing with difficult conversations is shunned. Establishing objectives is painful. Motivating teams is not their strength. Creating structures and disciplines on how to lead with impact and manage for results is some mysterious alchemy. These are skills they have obviously never been taught or practiced. But they are essential skills and in high demand. Research conducted by Harvard, the Carnegie Foundation and Stanford Research Center shows that on average 85% of job success comes from having well-developed soft and people skills. Employers agree. In a Harris Poll survey, 93% of them believe soft skills are just as important or more important than hard skills when evaluating hiring talent. Training is never a strategy, but an enabler. Before investing in large-scale training, employers need to look hard at their organizational design. Does the current structure support what the company wants to achieve? Have you identified the right capabilities to win? Do you have the right management processes in place? 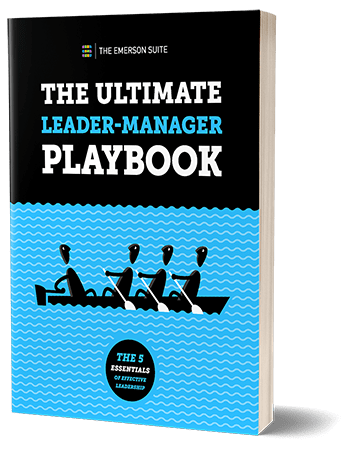 Does your team know how to manage to them? In failing to articulate their long-term vision on how to win, the retail company reduced their strategy to a two-day training exercise and a manager training manual that gathers dust on some shelf. Instead, they should have communicated why management development was more than just a way to appease a group of dissatisfied employees. They should have made it clear that developing effective leader-managers was vital to their competitiveness, and even to their survival. Companies seeking to develop effective leader-managers of today and tomorrow need to start at the top. Traditional management training often fails not because of program value. Nor is it due to presenter’s competence or participants’ desire to learn, or their readiness to change. Without a clear vision and strategy to win, without a framework for participants’ accountability to improve, and without a team management system that instills the right capabilities and provides just-in-time training, lasting adoption will always remain elusive.